The UK is set to face a freezing start to the year, with snow expected to blanket parts of the country next week. 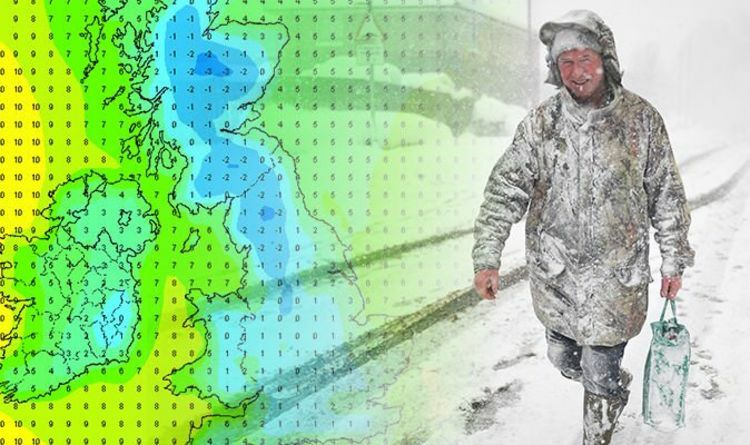 Snowfall will spread across Britain, after being carried in by blistering 60mph gale-force freezing winds. BBC weather has warned viewers that temperatures will plummet this weekend, before weather conditions take a dramatic turn for the worst. BBC meteorologist Louise Lear told viewers: “We will have highs of 11C this weekend but you can see this area of low pressure moving in from the north. “The winds will start to really pick up in the north on Monday. “This will see heavy rain and gale-force gusts of winds through Scotland and Northern Ireland before settling into England. “50 to 60mph gusts of winds will come in and that will feel quite cold. “As we go into Tuesday and Wednesday, for Scotland and Ireland, we will start to see some colder weather conditions, which could bring snow showers as we move through the week. The Met Office is expected to issue a yellow weather warning for Monday into Tuesday ahead of the temperature drop. A Met Office spokeswoman, Nicola Maxey, warned that temperatures would struggle to rise above freezing in the north-east. Some forecasters have suggested the UK will soon witness a repeat of last year's Beast from the East as a sudden stratospheric warming (SSW) was confirmed to have set in over the Arctic in December. A SSW can cause the airmass over the North Pole to split into two plunging cold air down into northern Europe – a so-called displaced Polar Vortex. Climatologist Judah Cohen from US-based Atmospheric and Environmental Research (AER) tweeted: “The first forecast of 2019 is also the first to start really showing the impacts of the #PolarVortex split on our weather especially across Europe. “Clear negative bias in the AO with lots of potential new snowfall and colder weather predicted. Government health officials have issued a be “ready” cold weather alert with freezing conditions expected to hit the UK over the next few days. Dr Nick Scriven, president of the Society for Acute Medicine, told the Guardian the cold snap would heap pressure on overstretched NHS services. He said: “Influenza is here and is already impacting the NHS and, with colder weather starting to set in, this will further stress already stretched services. “I and many colleagues across the country are anticipating mayhem this weekend as temperatures drop, but it will come as no surprise to us."